Would your dog like a frozen treat? We received a request to review a treat for our dog, Blue Belle, DOGSTERS ice cream style treats for dogs. They are made in the USA (a key to this dog loving family) all natural, low fat and low calories. 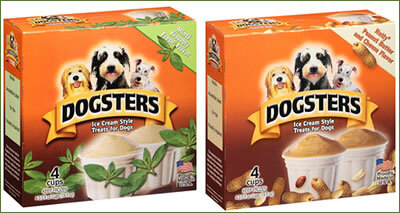 Dogsters says man’s best friend deserves healthy and delicious treats, too. Who doesn’t love a good treat. BUT, the question on this beautiful fall day is will Blue Belle, the rescue dog, agree that a frozen treat is cool and refreshing and much better than staying under the tree to keep the pesky squirrels out of our yard. Each treat comes in a plastic container with a paper lid, so obviously you will want to keep an eye on your dog and throw the trash away, so they don’t eat up the container. I think you will agree when you see Blue Belle’s reaction that she thinks they truly are DELICIOUS! This entry was posted in Pet Reviews, Pet Supplies and tagged dog, frozen, pet, review, treats by admin. Bookmark the permalink.